Homochirality is a unique property of living matter. It is a property that gradually disappears after the death of living matter. 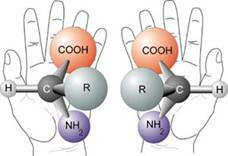 The origin of homochirality is therefore closely linked to the origin of life, which makes this topic a prominent research field in astrobiology. The problem of the possible origins of homochirality in living matter is frequently discussed in the literature. On the one hand, physical and external factors (e.g., the electroweak parity breaking, enhanced for example by heavy Cu complexes, as well as magnetic fields and polarized light) are hard to rule out. On the other hand, the possibility of a bifurcation process is quite plausible, but there is no unique mechanism. Possible candidates include autocatalysis combined with enantiomeric cross-inhibition in the RNA world (Sandars 2003) and the activation-polymerization-epimerization-depolymerization reaction of Plasson (2004). One purpose of this program is to establish the viability of these two different pathways, and to discuss the possibility of an interplay between them. Also the significance of crystallization experiments with stirring either for just demonstrating the effects of growth combined with competition, or as a primitive mechanism under prebiotic conditions should be discussed. Finally, quantitative aspects of approaches of involving physical and external factors should be discussed. Can some quantitative agreement be established regarding the subsequent role of amplification mechanisms and the enantiomeric excess that can be achieved? It is anticipated that such a program can be an important mile stone in this field, which is currently being attacked from the many different angles, without there being sufficient interaction between them. The program extends over four weeks, where the last week is devoted to a symposium. Although long-term participation is strongly encouraged, it is also possible to stay for shorter periods. The number of program participants is limited to a maximum of about 20 at any time. Funding will be available to accommodate program participants in apartments, whenever possible. Desks and shared office space will be available in the Nordita building. We expect to have only one regular review talk per week. Some of these talks can be oriented toward a broader audience. In addition, we plan to have one extensive discussion session once or twice a week, e.g. between 10:30 and 12:30. Each discussion will be started off by about 3 short presentations (20 min) by program participants talking on a related topic. There should be a vague idea about the topics of each session prior to the begin of the program (to be discussed with the participants via email), but revisions during the course of the program are anticipated. In addition, regular coffee session every morning at 10:00 and at 15:00 provide informal means of exchanging ideas and starting collaborations. Other than that, we try to keep the days open for doing regular work. For the last week (February 25-29) we consider organizing an open symposium that is available to a broader community and, in particular, to people that could not come for the full duration of the program. We are also considering to collect a number of papers for a special issue of Origins of Life and Evolution of the Biosphere. This would allow us to have a permanent record connected with the activities and discussions at the program and/or the open symposium. Scientists interested in this progam are encouraged to apply by filling in the registration form. The deadline for applications is December 15, 2007. Arrival/Departure times of Participants, pictures, roster. How to get here? (this link has a description and a map). The meeting takes place in the Nordita building, just next to the AlbaNova main building.